Have you been drooling over those Hello Kitty Cafe food pics from Japan? I have (and I've also been trying to come up with ways to turn all my food into cartoon characters). Well, there's good news if you can't afford a trip overseas and you happen to live in California. We spoke to Hello Kitty Cafe's managing partner Allan Tea, who told us that everything from the food to the decor of the space will be featuring the iconic Sanrio character. He said their main focus will be on cafe-style food: artisan pastries and desserts, as well as savory foods like salads, sandwiches and sliders. They'll also be serving coffee drinks like espresso. And this isn't technically the first U.S. Sanrio Cafe. That honor goes to Honolulu, which is home of the Sanrio Cafe. 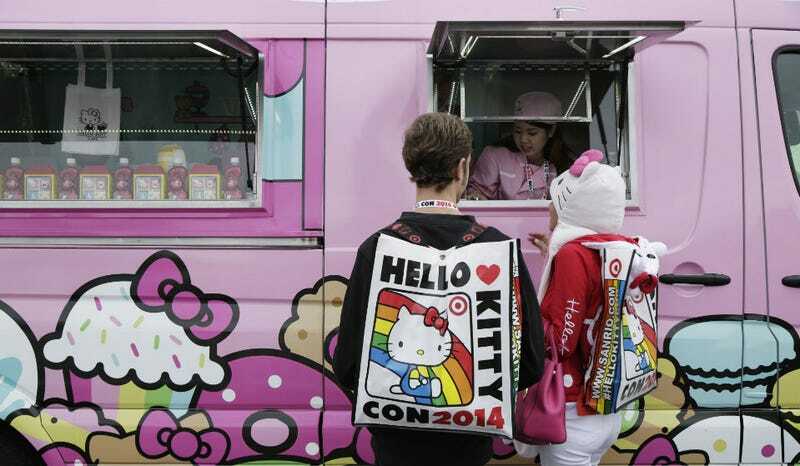 If you can't wait another year or so to try out Hello Kitty-themed food, the mobile truck will be available for private parties, or for when you just want to put on old reruns of Punky Brewster and devour their pastries and snacks all by yourself—no judgment! Their website and Facebook page aren't working just yet, but keep refreshing those pages obsessively until you break the Internet. That way they'll understand just how important this is to all our lives.